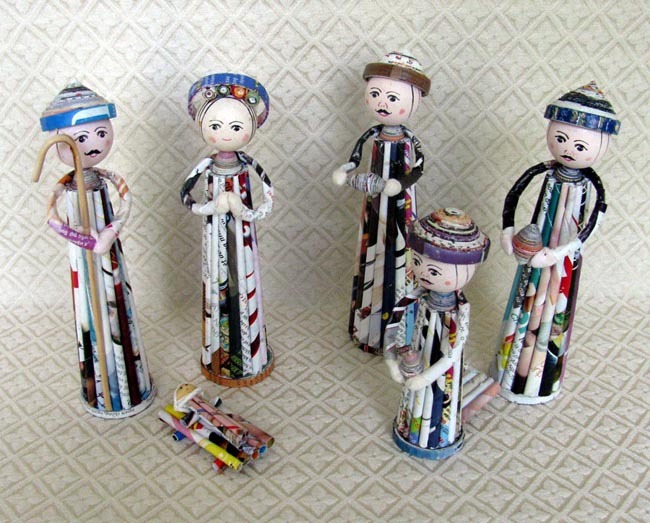 This taller Nativity set is made from multiple layers of rolled, coiled and lacquered recycled magazines in Vietnam. The faces are painted wood. The set includes six figures: Joseph, Mary, baby Jesus, and three wise men. The figures stand 7.25 inches tall. By putting a creative twist on recycling, young Vietnamese adults have reshaped their lives. In 2006, Hien Dang founded a group of artisans who are literally turning trash into treasure. The group, based in Ho Chi Minh City, began by making paper dolls and now specializes in crafting colorful coiled paper bowls and other products from recycled magazines.